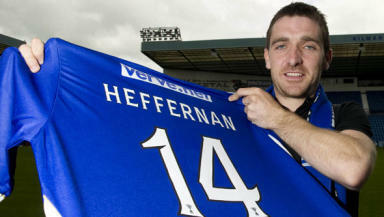 Kilmarnock have completed the signing of Irish striker Paul Heffernan from Sheffield Wednesday. Kilmarnock have concluded their second piece of transfer business this summer with the acquisition of Paul Heffernan on a two year deal. After the signing of Danny Racchi from York, newly appointed Killie manager Kenny Shiels has moved quickly to bolster his front line. Kenny Shiels said of his new recruit: "He's a striker who I have known very well from down in England. "He's been a successful goalscorer both with Notts County and Doncaster Rovers, and he's a legend there. "He will bring goals to the team and I am excited by what he can offer Kilmarnock." Described by his new manager as a "fox in the box striker", the 29-year-old was a cult hero at Notts County, managing 11 goals in 2002/03 and 21 in 2003/04. A move to Bristol City was less successful, and so the Irishman was sold to Doncaster Rovers. At Doncaster he was again amongst the goals, scoring 13 in his first season, 21 in his second and 9 for the side that won promotion to the Championship via the playoffs. Despite ten goals in his first season of the English second tier, Heffernan was sent out on loan to Oldham and Bristol Rovers before being freed to join Sheffield Wednesday. Meanwhile, Kenny Shiels confirmed the clubs' interest in Dundee midfielder Gary Harkins, stating: "it's not final yet, but it's one that we are working really hard to try and get on board." Further players are likely to be added with chairman Michael Johnston that there were a couple of deals "on the fringes" and that he expected a series of trialists to be looked at before the start of the season.